You've found the “U.S. Spanish (Brush) Goat Breeders” page here at Hobby Farm Wisdom! If this is the first time you have visited our site: Welcome! The Spanish goat is also referred to as “brush” or “scrub” goat, and originally comes from Spain. They are now used for meat production but have been kept for clearing brush and other undesirable plant species from pasture lands. They have also been used for their hides. Spanish goats are hardy and can thrive in difficult environments. 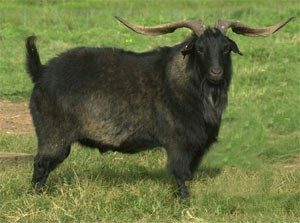 They are a favorite in the Southeast (especially Texas) and go by many names: wood goats, briar goats, and hill goats. They are preferred for being tough, hardy, adaptable and self-reliant. These goats can breed out of season and are excellent range animals. They have a straight head with long ears and horns. They have an even large framed body and usually short hair which can come in a variety of colors.